We're a growing name within the aftermarket accessory world. We offer high demand, quality products for a savings vs OEM equipment. Our web gallery has additional images from our satisfied customers. With 18mm O2 Bungs; EX-02. Our pipes are made of one whole piece pipe, not welded together to cut cost. Body Diameter: 1 3/4 inside Diameter. Cluster Chrome w/ black Header wrap. 18mm bungs on each pipe with plugs. One piece sturdy tubing design in result of better airflow. Supplied brackets for mounting the pipes together only. You might need to make your own brackets for mounting to the frame. No intended for Dyna and Touring models (need some minor modifications for the application). You might need to loosen or remove the pipes to get access to the oil cap. Also need to make a small notch on the newer Dyna to make room for the pipes. For most of the 2010 and up models, you need the 18mm-12mm adapter for the O2 sensors. Note: The exhaust mufflers are not for Sale in California unless you sign an "off road use only" waiver. Chrome-plated universal fishtail extensions are easily installed mounting clamp not included NOTE: Not all products are legal for sale or use on pollution controlled vehicles. Check your local laws and the manufacturers information. Discoloration (blueing) is the result of tuning characteristics, cam timing, carburetor jetting, overheating, etc. And is not caused by defective manufacturing. See the CHEMS/LUBES section for products that will help prevent or remove blueing. NOTE: Installation of a new exhaust system may change your motorcycles fuel-air mixture requirements. If a jet kit or fuel processor is recommended, see the FUEL/INTAKE section. The Air Resources Board (ARB) does not permit the use of aftermarket emission-related parts that alter the air/fuel ratio of an emission-controlled vehicle. The California Air Resources Board (CARB) does not permit the use of aftermarket emission-related parts, devices, or systems that alter the performance of OEM emission-related devices unless CARB has issued an Executive Order, other than on racing vehicles on closed courses. Harley-Davidson, Electra Glide, Tour-Glide, Road Glide, Road King and Tour-Pak are registered trademarks of Harley-Davidson, Inc. The use of these terms throughout these listings is for identification purposes only. All textual and graphical content appearing within our listings are the property of Mutazu Inc. Pricing & misprints subject to change. 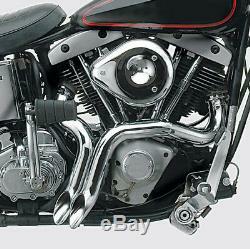 The item "Wraped 2 Drag LAF Pipes Exhaust Muffler 4 Harley Touring Dyna Softail Sportster" is in sale since Monday, March 19, 2018. This item is in the category "eBay Motors\Parts & Accessories\Motorcycle Parts\Exhausts & Exhaust Systems\Silencers, Mufflers & Baffles". The seller is "mutazu" and is located in San Leandro, California. This item can be shipped worldwide.